4 Transwiki some texts from oc-wiki? The new version of MediaWiki will be on test wikis and MediaWiki.org from 9 January. It will be on non-Wikipedia wikis and some Wikipedias from 10 January. It will be on all wikis from 11 January (calendar). You can join the next meeting with the Editing team. During the meeting, you can tell developers which bugs you think are the most important. The meeting will be on 9 January at 19:30 (UTC). See how to join. You can join the technical advice meeting on IRC. During the meeting, volunteer developers can ask for advice. The meeting will be on 10 January at 16:00 (UTC). See how to join. The new version of MediaWiki will be on test wikis and MediaWiki.org from 16 January. It will be on non-Wikipedia wikis and some Wikipedias from 17 January. It will be on all wikis from 18 January (calendar). You can join the next meeting with the Editing team. During the meeting, you can tell developers which bugs you think are the most important. The meeting will be on 16 January at 19:30 (UTC). See how to join. You can join the technical advice meeting on IRC. During the meeting, volunteer developers can ask for advice. The meeting will be on 17 January at 16:00 (UTC). See how to join. Transwiki some texts from oc-wiki? I have a question about some medieval text that is currently in article namespace on Occitan Wikipedia, and whether transwikifying it to Wikisource would be a better idea. I was under the impression that most wikipedias prefer references or short excerpts from primary sources, and not whole texts, plus, placing it here seems like the right venue. I'd prefer to see these texts transwikified here, instead; and then I could refer to them more easily from en-wiki (and the other wikis I work on), as well as using the en-wiki templates that provide a linked Wikisource box with a logo, and so on. Thanks, Koavf, that's pretty much what I figured. I guess my real question, is, now what? Do you (or someone else here) want to take this on? Or, do you want me to do something? The means to get help in Wikisource or Wikimedia seems very byzantine. In other words, not very helpful as the admins are not readily accessible. "This action has been automatically identified as harmful, and therefore disallowed. If you believe your action was constructive, please inform an administrator of what you were trying to do. A brief description of the abuse rule which your action matched is: Antispam"
The problem is that there is no easy way to "inform and administrator". Perhaps the message should contain a link to a form or email to make the admins aware of problems. —unsigned comment by Awc2008 (talk) . @koavf: I created the page "The Morals of Chess" which is an essay Benjamin Franklin wrote in 1786. Can you remove the 'spam' designation so that I can actually put some content in it? Thanks! —unsigned comment by Awc2008 (talk) . Wikisource Basque was approved for its own subdomain on 12 March. Congratulations! Please continue to contribute to the Basque resources here until the project is exported. The phabricator task is phabricator:T189465. Please note that some data are still needed to complete the task; project contributors should check there. @Candalua: I'm responsible for keeping LangCom on track now, so I assure you we will be looking at things. Frankly, it's harder for me to parse what might or might not be ready in WS than in the other projects, because (a) I'm a sysop at Incubator, so keep track of what happens there, and (b) there's one page at Beta WV where the 50-odd tests are summarized. But I am always glad to have someone contact me to tell me they are ready. In your case, I'll have a look at your project in the next few days. If the only thing missing is activity, but there was a long period where activity was fine, I'll take it to LangCom anyway, provided that some activity resumes. Ooswesthoesbes, that would be very helpful. Thanks. The Wikimedia Cloud Services team is working on a new project called Toolhub. The goal is to make it easier for Wikimedians to discover software tools they can use. You can leave feedback on the talk page or email jhareTemplate:Errorwikimedia.org to leave private feedback. I apologize if this message is not in your preferred language. Please help us translate this message. What does your participation on the Wikimedia projects look like? Do you edit articles? Upload files? Patrol vandalism? Translate articles? Translate interface messages? Do you organize people, online or offline? Do you train new editors, or new trainers? Do you write code? There are many different ways to contribute to Wikimedia – more than you would expect just from reading Wikipedia articles. Over the past several years, volunteers have developed technical tools that help Wikimedians improve content, patrol vandalism, and perform many other tasks. They make it possible to do what the wiki software alone cannot accomplish. Without these tools, many of our projects would slow down to a crawl. As it was noticed yesterday on some wikisources, some pages are no longer coloured in index. Eg. Page:'E Lluce-luce.djvu/165 in Index:'E Lluce-luce.djvu. This problem affects mainly older pages (not edited since 2015), bot also some newer ones and according to phab:T198470 it is a delayed effect of last year changes in proofreadpage. Billinghurst and I think that the best way to get rid of this problem is to null-edit ALL pages in the Page: namespace (purging them is not enough). Touching all pages will update their structure to the newest one and, potentially, will allow us to avoid similar page structure-related problems in future. Revibot is a global bot for fixing double redirects. Since no bots seems to be fixing them, I would like to help automatically fix them - except I would like a bot flag to hide them from RecentChanges, and I can run it at a faster rate. If you want it running without flag, that's fine for me as well. Without bot flag, I will be running them at 1 edit per minute, and with the bot flag, I will be running at 6 edits per minute. (Usual practice per global bot policy.) Thanks for the consideration! This is not a big difference for displaying at the end of page in the Page namespace. However, only at this point the above note concerning correctness is indeed valid. The disappearing-in-the-middle-of-line function of the &shy; will not be used here as the joiner will appear only at the end of last page line. 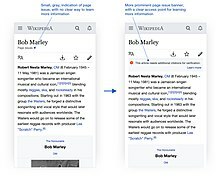 We can't do an awful lot to the main page as it has to be in sync with the portals of www.wikipedia.org, www.wiktionary.org etc. Each year is around 100 pages. Cosmoglotta at its height was 12 pages per issue, one issue per month, so many years have exactly 144 images. Also for a number of years it published two versions of the magazine, which is why there are two links. 1) Importing the images: is one at a time best? The closest thing the library site has to displaying all pages on one screen is this: http://anno.onb.ac.at/cgi-content/anno-plus?aid=e0g&datum=1922&pos=1&size=45 But I don't think that'll be enough. I have no problem with doing them one at a time though. 2) Two orthographies. The orthography and vocabulary changed somewhat between the years 1922 and 1947, the latter date when it took on its current form. Also for a number of years, especially during WWII, it was put together on a pretty shoestring budget with a typewriter and so has a number of typos here and there. I would ideally like to type up two versions: 1) the way it was originally printed, and 2) the cleaned up, modernized version. The difference is not great, but since nobody speaks Occidental as a native language it's important to not confuse anyone wanting to learn it or trying to decipher it (e.g. if the spelling is off it may not show up in a dictionary). All in all it's about 3000 to 3500 pages. I would start with Cosmoglotta B which goes from 1935 to 1947, as that is when the most work was put into cleaning up the language, and also due to the period's historical importance (Cosmoglotta A did not publish during the war). Hi @Mithridates:, I see that lots of Cosmoglotta fascicles have already been uploaded into archive.org, here the results of a first search: https://archive.org using creator:"Societé Kosmoglott" into search field. I think that mulwikisource is the best project to upload multilingual works, please try the tool https://tools.wmflabs.org/ia-upload/ that often runs even if IA item haven't a djvu file. This page was last edited on 10 February 2019, at 23:48.